Good morning lovely readers. I hope some of you might have came across the recent Bumps n Baby facebook page post. It was about to guess the secret healthy ingredients of unniyappam. In today’s post I am going to reveal the secret healthy ingredients to prepare those nutritious unniyappams. But before heading into the recipe, I wish to tell you the story behind this recipe. During one of my usual Whatsapp chat with Sangeetha, she asked me whether I can do anything with oat meal and carrots and turn it into a kid-friendly recipe. One fine evening, I found my non-stick unniyappam pan sitting in one corner of my cupboard. Suddenly an idea clicked: ” Why not to try unniyappams with oats and carrots”, so I sprang into action in my kitchen coming out with these delicious healthy unniyappams. 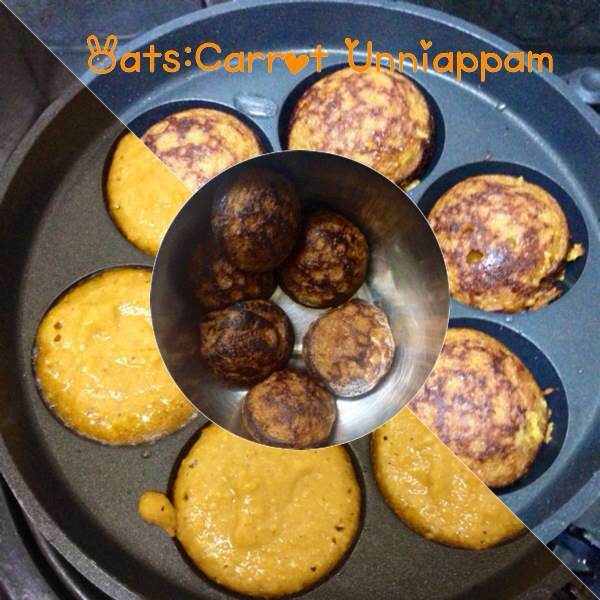 I think you won’t find oats carrot unniyappam recipe in any other food blogs. 1) Oats: Oats are a good source of soluble dietary fiber, phosphorus, selenium, manganese, iron magnesium and vitamin B1. 2) Carrots: Carrots are rich in beta carotene and Vitamin A. They are very good for eyes and provide you with protection against heart disease and stroke while helping you to build strong bones and a healthy nervous system. Roast oats for two or three minutes until a nice aroma comes. Let it cool for a while. Powder it in mixie along with baking soda and elachi powder. Chop carrot into pieces, cook it in cooker with enough water for two whistles, cool it and grind to paste using mixie/blender. To the powdered oats, add rava, salt, carrot paste, ghee and dates syrup. Mix it well. Take little water in the mixie jar you used to grind carrot and use that water for mixing up, remember It should be like idly batter consistency, don’t make it watery. Let the mixture sit for 15 to 20 min. Keep the unniyappam non-stick pan on the stove, grease it with oil, after heating the pan add a tablespoon of batter in each slot. Drizzle little oil or ghee on the side and cook it in low flame. Once it started turning brown,using fork or spoon turn the other side,cook and take it out. Repeat the step for remaining batter. Let unniyappams cool for a while. Unniyappams are now ready to serve. Roast oats for two or three minuntil a nice aroma comes.Let it cool for a while.Powder it in mixie along with baking soda and elachi powder. Chop carrot into pieces,cook it in cooker with enough water for two whistles,cool it and grind to paste using mixie/blender. To the powdered oats,add rava,salt ,carrot paste ,ghee and dates syrup.Mix it well.Take little water in the mixie jar you used to grind carrot and use that water for mixing up, remember It should be like idly batter consistency,don't make it watery. Let the mixture sit for 15 to 20 min. Keep the unniappam non-stick pan on the stove, grease it with oil, after heating the pan add a tablespoon of batter in each hole .Drizzle little oil or ghee on the side and cook it in low flame. Once it started turning brown,using fork or spoon turn the other side,cook and take it out. Repeat the step for remaining batter. Let unniappams cool for a while. 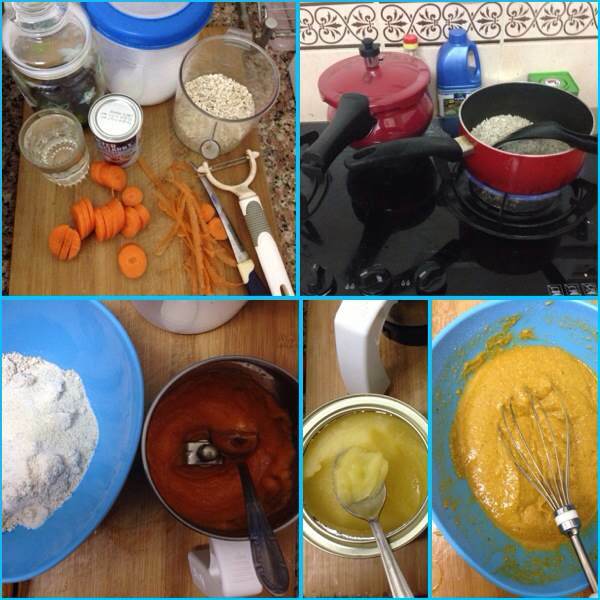 Tasty, yummy and healthy oats carrots unniyappams are ready to be served. Please try it out. I am sure your little one would love it. Thank you so much for your feedback .its feedback like this gives us encouragement and confidence to come out with more healthy recipes . idli cooker idea is awesome ?? Indeed a yummy healthy recipe for kids and for us too…. Thanks Jaya for sharing!!! Full credit to you Jaya.. Amazing recipe that too healthy .. Simply awesome..